I recently read a little story about a little girl that touched my heart. It seems that this little girl was late coming home for supper one evening. When she got home her parents were understandably upset. He questioned her about why she had been so late, after all they had worried about her! 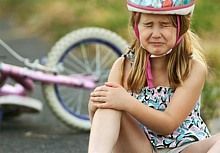 The little girl said, "I stopped to help Marcie, she had a wreck on her bicycle and it was broken." Her father said, "But you don't know anything about fixing bicycles!" To which the little girls replied, "I know, but I stopped to help her cry." Now you may or may not know anything about fixing bicycles, or cars, or washing machines, or refrigerators or much of anything else. But when friends have broken things in their lives and are in despair, we can help them with that! The truth is that you are rarely in the position of being able to fix the brokenness of someone's life, but you can help them cry about it. You can encourage them and help them through the hard times in life! So count your blessings and do what you can! Rejoice with those who rejoice, and weep with those who weep (Romans 12:15 KJV). Laugh with your happy friends when they're happy: share tears when they're down (Romans 12:15 MSG). We are entering into that time of the year when you are more apt to notice the sorrow or rejoicing of those around you. You may take more notice of people (or groups) trying to relieve the difficulties of those who are struggling to make it in our world. People take up collections of money or of food and clothing to help those who might be less fortunate than we. They try to help folks who are struggling just to make ends meet. So count your blessings and do what you can, but if you have nothing to help them with physically, then share their sorrow or suffering: cry with them! And if they are happy: laugh with them! "Beyond Fixing Bicycles" by Russ Lawson is licensed under a Creative Commons License. Heartlight encourages you to share this material with others in church bulletins, personal emails, and other non-commercial uses. Please see our Usage Guidelines for more information.